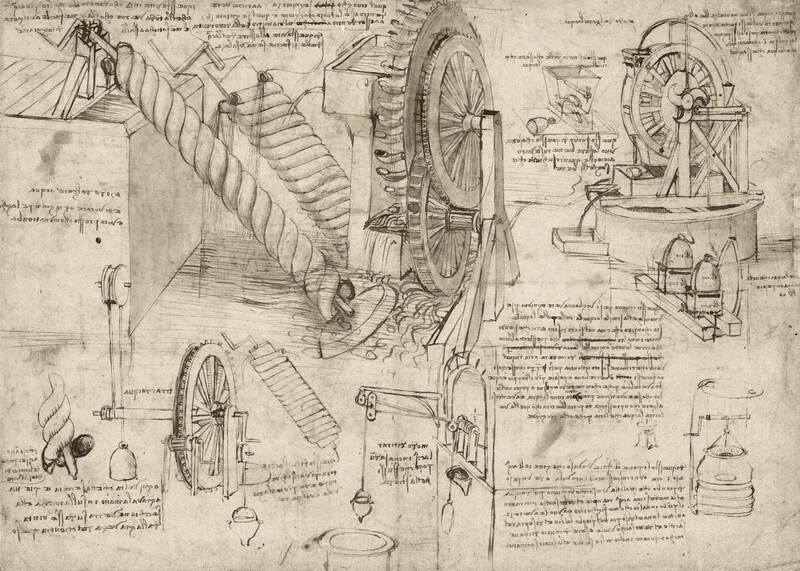 Archimedean screws and systems for raising water, from Leonardo da Vinci, Codex Atlanticus, f. 26 v. Milan, Biblioteca Ambrosiana. This section deals with viscous effects in external flow past bodies immersed in a stream. When the Reynolds number is large, viscous forces are confined to a thin boundary layer and wake in the vicinity of the body. Flow outside these “shear layers” is essentially inviscid and can be predicted by potential theory and Bernoulli’s equation. In the case of a flat-plate boundary layer the use of momentum-integral estimates enables us to predict the wall shear, friction drag, and thickness of such layers. These approximations suggest how to eliminate certain small terms in the Navier-Stokes equations, resulting in Prandtl’s boundary-layer equations for laminar and turbulent flow. The two animations refer to the Blasius solution of a laminar flow past a flat plate and the boundary layer equation simplification.